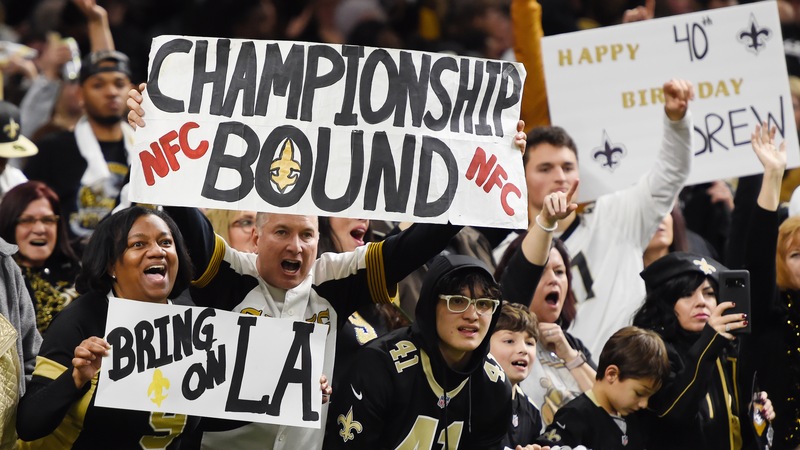 PropSwap is celebrating its biggest ticket sale yet, as a Super Bowl futures ticket on the New Orleans Saints sold for more than $57,000 on Saturday. Clay Travis and "Cousin Sal" Iacono of FS1's "Lock It In" show were revealed as the buyers. How's this for kismet? The same bet that helped inspire PropSwap in the first place -- a Saints Super Bowl future -- has become the biggest sale in the history of the site. Philadelphia sports bettor Brad Feinberg sold an $8,000 ticket on the Saints to win the Super Bowl on Saturday at 20/1 odds ($168,000 payout). His return: $57,500. The buyer(s): Sports media personalities Clay Travis and “Cousin Sal” Iacono, co-hosts of the FS1 betting show, “Lock It In.” <a href="https://twitter.com/darrenrovell/status/1086641394272428032" class="embedly-card" data-card-width="100%" data-card-controls="0">Embedded content: https://twitter.com/darrenrovell/status/1086641394272428032</a> “To get two guys who’ve been in sports betting for a super long time is really fun,” said Luke Pergande, PropSwap’s co-founder, who once held a Saints [Super Bowl XLVIII](http://www.espn.com/nfl/game?gameId=340202007) futures ticket that went unsold, as there was no marketplace at the time. “We did not give them any preferential treatment -- they were the highest bidder. They talked about the ticket on Tuesday on 'Lock It In,' so we knew they were aware of it. They reached out (Friday) morning, and it became known they’d be the highest bidder, but we weren’t sure (Feinberg) would accept.” Feinberg says he was overexposed on the Saints, and was looking to hedge. He also holds big positions on the Chiefs and Rams, but not the Patriots, his least favorite team, aside from perhaps the Celtics. Feinberg has been on a roll of late. He nailed three of the four College Football Playoff entrants, all but Alabama, which had preposterous odds all year. He was heavy on Clemson, cashing big. But cashing out on this Saints ticket was a no-brainer for him. “I do think New Orleans is going to win, but that’s irrelevant to me,” he said. “I’m trying to maximize profits. If they win, I’m not going to say I cost myself $111,000.” For the buyers, they got the Saints right now at +192, a boon compared to the +175 odds that are the norm for their futures right now. “There is obviously value here,” Travis told The Action Network’s Darren Rovell. “It’s not insane value, but it was worth doing.” For PropSwap, it was not just their biggest sale, but more proof in their product: A marketplace for sports bets that sometimes make huge leaps in value after the bet is placed. Two years after Pergande held that Saints futures bet at 50/1 only to have nowhere to sell it once it the teams’ odds plummeted after a hot start, PropSwap was born. Now four years later, a Saints ticket brought the company its biggest sale. “I don’t know how the stock market is doing this year, but I doubt you’re turning $8,000 into $55,000,” Pergande told BetChicago. “And for the buyers, +192 were the best odds in the universe right now.” __MORE NFL coverage:__ [NFC Championship Game preview](https://www.betchicago.com/rams-saints-betting-lines-records-ats-pick-total-rematch-nfc-title-preview) | [AFC Championship Game preview](https://www.betchicago.com/patriots-chiefs-betting-lines-pick-trends-sharps-preview-afc-championship) | [Staff picks](https://www.betchicago.com/nfl-picks-against-spread-conference-championships-patriots-chiefs-rams-saints) *** This has been quite the month for PropSwap, which was formed by Pergande and Epstein in 2015, but has been on the rise in recent months as sports gambling legalization has brought them into nine states, with the expected goal of 20 by the end of the year. Pergande was recently in Las Vegas for more than two weeks, attending the Consumer Electronics Show and, along with Epstein, auditioning for ABC’s "Shark Tank." “As soon as I leave, we have our biggest sale ever,” Pergande said. PropSwap now has staff in all nine states, with ticket-collectors positioned to accept slips wherever betting is legal. Sellers can sell from anywhere. Feinberg has used the service in the past, flipping Las Vegas Golden Knights and Tennessee Titans tickets, and buying a Baker Mayfield-for-Heisman ticket that paid off. “When I see deals I like, I like PropSwap,” he said. “I’m happy for those guys. I deal with Luke all the time. I was excited for them. I really do get what they're doing. And I listen to Cousin Sal's podcast all the time. It was good for the gambling community. You get Cousin Sal getting his show hyped, Luke and Ian get PropSwap hyped and it helped me get more neutral.” __Also see:__ AFC Championship Game [prop bets](https://www.betchicago.com/best-prop-bets-patriots-chiefs-afc-championship-game-jan-20)/[weather report](https://www.betchicago.com/afc-championship-weather-report-wind-chiefs-patriots); NFC Championship [prop bets](https://www.betchicago.com/best-prop-bets-rams-saints-nfc-championship-game-jan-20); [betting report](https://www.betchicago.com/nfl-betting-report-sharps-moneyline-saints-chiefs-rams-patriots) *** For too long, Feinberg was greedy. Then he learned a lesson, and with his own team, no less. “I had a six-figure ticket if the Sixers went to the Finals last year,” he said. “I got them at like 50/1 odds. Won the first round, and then Boston, and Boston was a huge underdog, even with home-court advantage.” Feinberg, a huge 76ers fan and season-ticket holder, posted his ticket on PropSwap and took offers. He could have gotten around $38,000 for a ticket that would have paid off more than $50,000. “I was convinced they were gonna win,” he said. “They lost Game 1, lost Game 2, lost Game 3, and the ticket was worth zero before I could breathe. But I’m happy it happened to me. I found out I can bleed, too. (My loyalty) blinded me. The first time it has ever happened to me. Plus … I hate the Celtics.” Feinberg has always looked for the advantage; on trips to Las Vegas, his friends would routinely make fun of him for visiting Southpoint, MGM, Caesar’s, the Venetian, Westgate, Treasure Island and William Hill properties, all to hunt for the best futures. He knows a good buy when he sees one, even if he has dodged some bullets. “I offered someone a crazy amount to buy the Golden Knights last year, and the guy said they were destined to win. Destined to win? There's no destiny with this stuff. You're not owed luck.” Of course, Vegas lost in five games to the Capitals. __PLAY:__ Our free [NFL Conference Championship Pick 6](https://betchicago.chalkline.com/games/sunday-nfl-challenge). Just correctly answer six prop questions for Sunday's games to win a BetChicago prize pack.